Omonoimi Jinja (Oomonoimi / Ohmonoimi / Ohomonoimi Jinja) is a shrine in Yamagata that venerates Mt. Chokaisan. There are three shrine locations. The mountain itself is the Omonoimi-no-Kami. 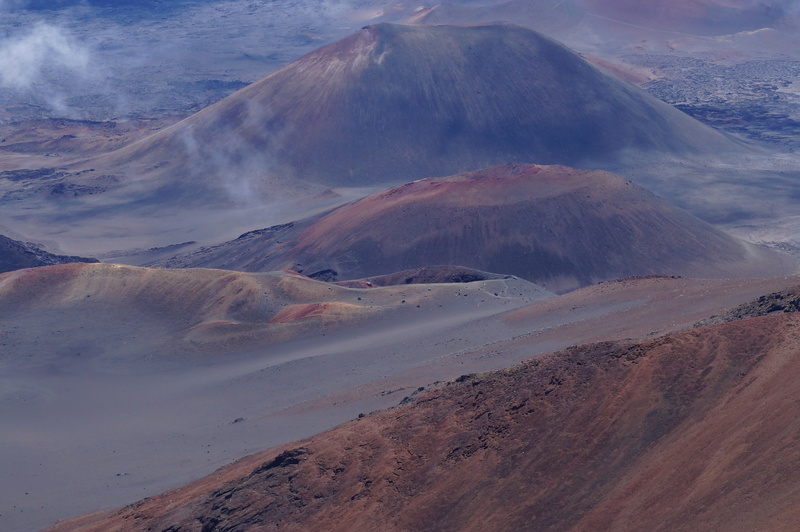 It is an active volcano and has erupted several times in recorded history. Kita-no-yama, Awa-umi-dake, was the name of Chokaisan before it was renamed in the year 1342. This mountain marked the northern boundary of the land in olden days, and it protected against invasions. On the peak of Kita-no-yama is the honsha of Omonoimi Jinja. Who is Omonoimi-no-Kami? In addition to the Kita-no-yama mountain, this kami is also Ooimi-no-Kami, Toyouke Daijin, and Kurakine-no-tama-no-mikoto (brother of Izanagi), according to shrine information. The mountain became a place for the practice of shugendo. There are two gateway training centers in the foothills miles away from the peak. They are called the Warabioka-guchi and the Fukuura-guchi. They were both founded in about the year 564, more than 1400 years ago. In the year 862, the shrines were listed in Engishiki as Myojin Taisha and Tsukiyama Jinja (Fukuura-guchi). Then it merged into a temple shrine, the Chokaisan Daigongen during the syncretic period. In Meiji times it separated and became the Omonoimi Jinja. It is the Dewa Ichinomiya. When we visited, I found it was a lovely place with stone lanterns, a large stone water basin, and a large hexagonal disc on the ground. There was no one there so we walked around and took pictures. In particular, I photographed the signboards. There were four hokura in the rear upper section of the keidai. It had been raining and it was pretty cold. Here are some photos numbered 0317-0360. We were especially eager to see this shrine since it lists as one of the saishin the Toyoke-Ookami, fifth Takamimusubi of Hitakami and his other aspect, Ukanomitama no Mikoto. Now that I have examined the posted map more closely, I wish I had climbed the kaidan to the top of the hill through the buna forest to see the ancient worship place. There was an office where I obtained a pamphlet from a guji-san. 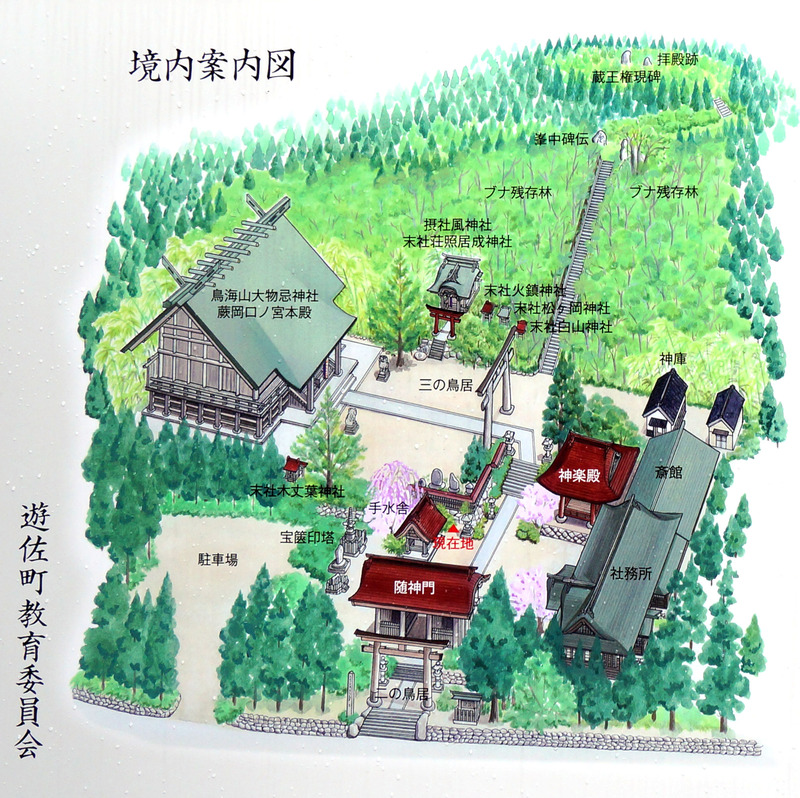 Although there is a map, it only shows the location of the honsha on the mountaintop and not the auxiliary shrines which are further down in the foothills. This shrine is approached from one of the streets of the machi. Just inside the grounds there was an ike with a momiji tree in full color. The honden was up on the hill. It faced south. After looking around the upper keidai, we noticed on the right a path leading further up. We followed it and found nothing of interest. Still, it must lead to something. Regretfully there was no map to consult. There is no doubt that the Warabioka site is ancient. 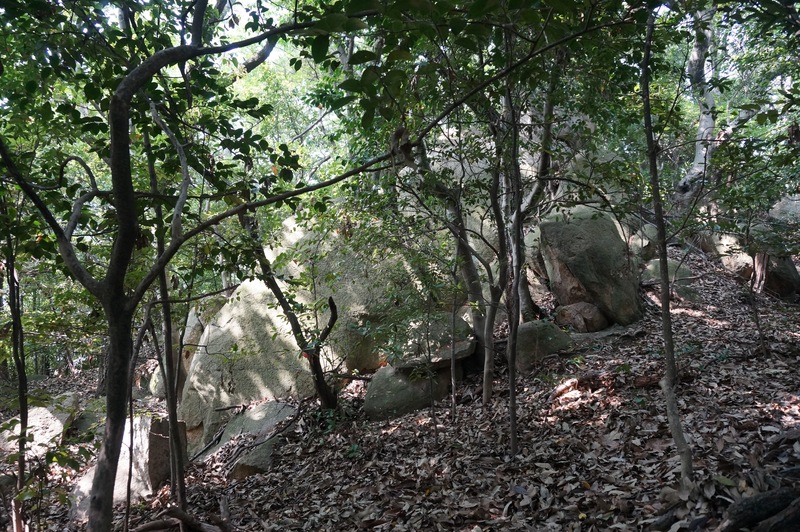 The buna trees on the hill are remnants of a primeval forest. At the top of the hill are remains of an ancient place of worship. We know that the gateways served as training centers for the shugenja. Although there is no hard evidence, it may well be that the Omonoimi Jinja are honoring Omononushi from the days of Hotsuma. He, as Ohonamuchi, provided for the people of the northern country as did the protector mountain Omonoimi Kita-no-yama. They are both Omonoimi-no-Kami! This entry was posted in Hotsuma, Jinja and tagged Omonoimi, Yamagata on 2014/08/28 by Okunomichi. 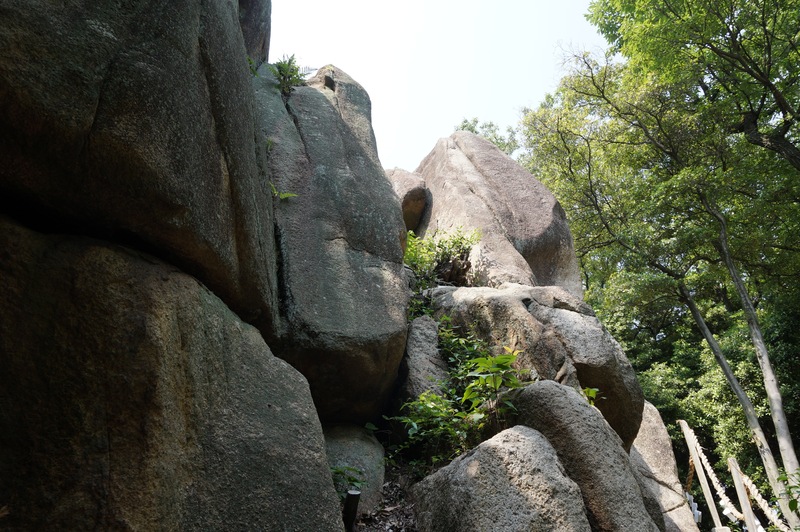 Rokkosan is a fascinating mountain range in Hyogo-ken. It forms the mountains that are the backdrop to the port city of Kobe. As we wrote elsewhere, one of the shrines (Ikuta Jinja) on the mountain faces the port and has served as a lighthouse for ships at sea. The buildings of Kobe look new, and perhaps they are newly built, after the disastrous Kobe Hanshin earthquake of 1995. Prior to that, the city suffered greatly from American firebombing in 1945. Now the city is quite prosperous as a center of business activity. The cable car takes skiers and nature lovers up to the peak for a fine view of the city below. Many young and not-so-young regularly walk these hiker-friendly mountains. And yet, Rokkosan keeps its mystique. There are many important shrines in the Kobe area. In fact, one of them, gave its name to the city. Kobe comes from Kambe, people appointed by the Emperor to maintain the shrine, and it means “Door to the Kami”. 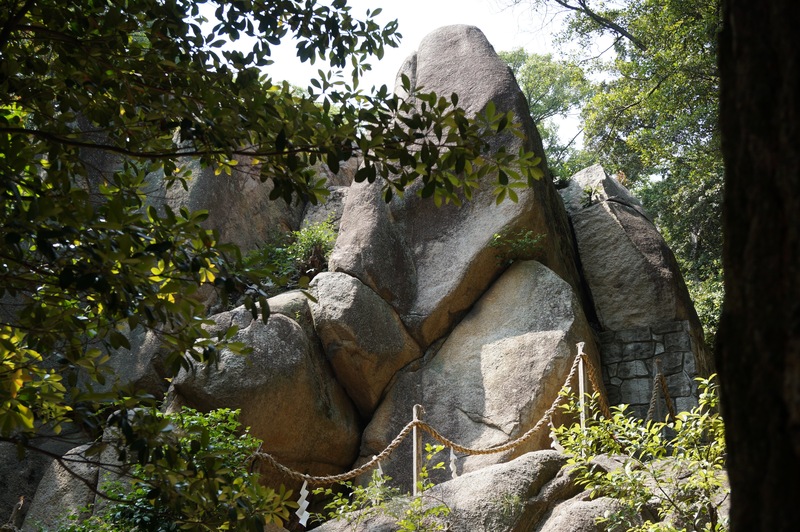 Rokkosan has since prehistoric days been regarded as sacred. 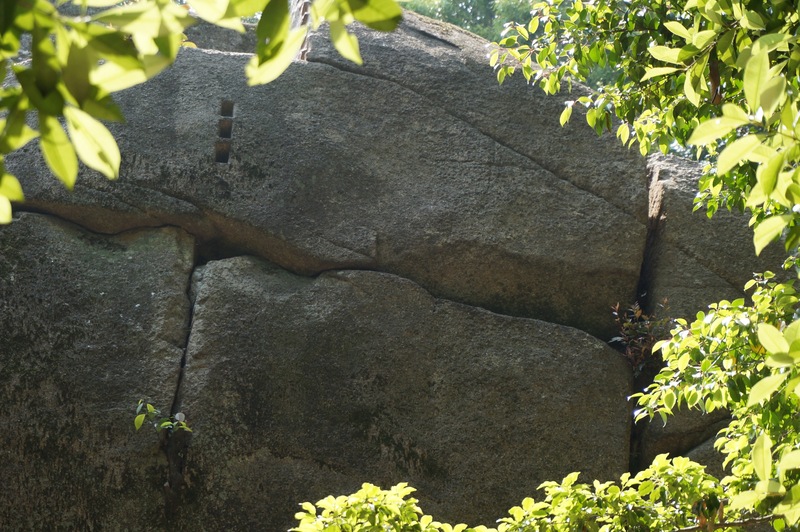 Megaliths of different types are found in those mountains, and some have clearly been worked by human hands. Standing stones in the mountains were the first shrines created by man. Archaeologists have found artifacts supporting ceremonies held on sacred grounds from long ago. 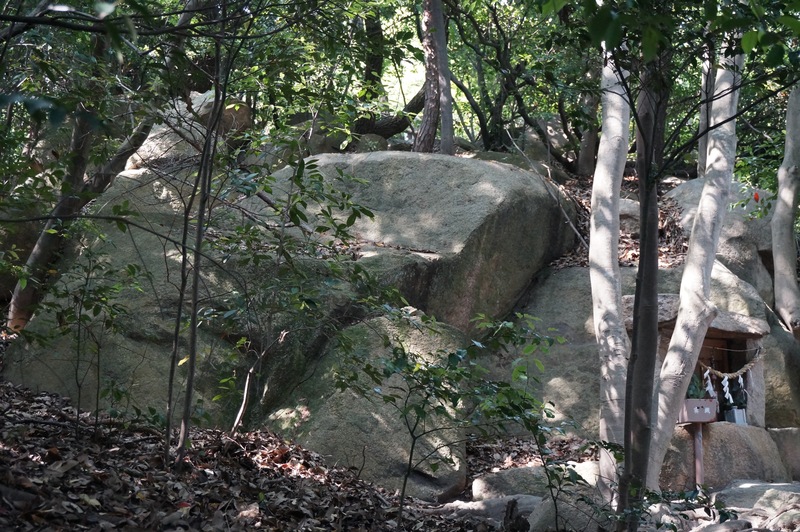 We present our photos of megaliths at different locations of Rokkosan. 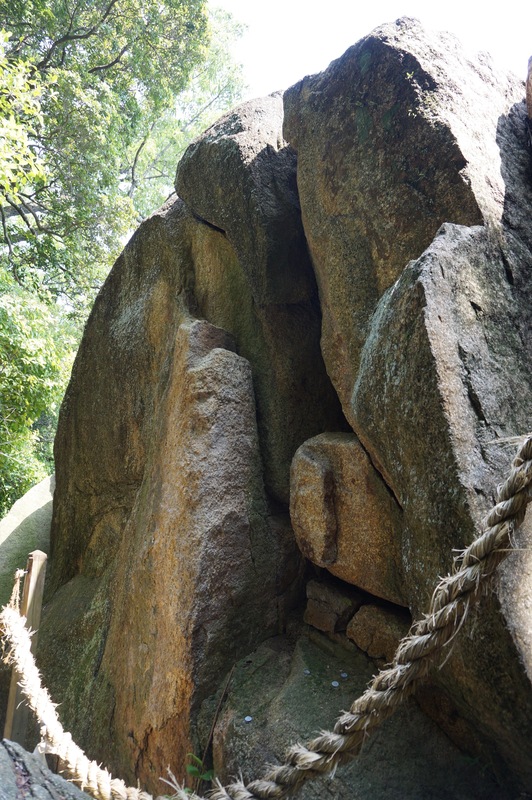 Here, we showcase the megaliths of Koshiki-iwa Jinja. 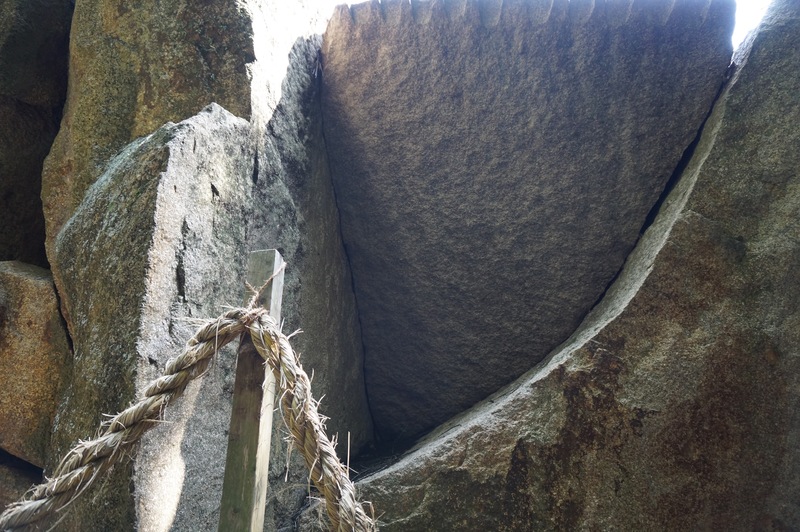 This is the megalithic monument towering over the Wakahima hokora. See that post. These are photos of the front, side and back. Note how beautifully the arcs of the two stones fit. 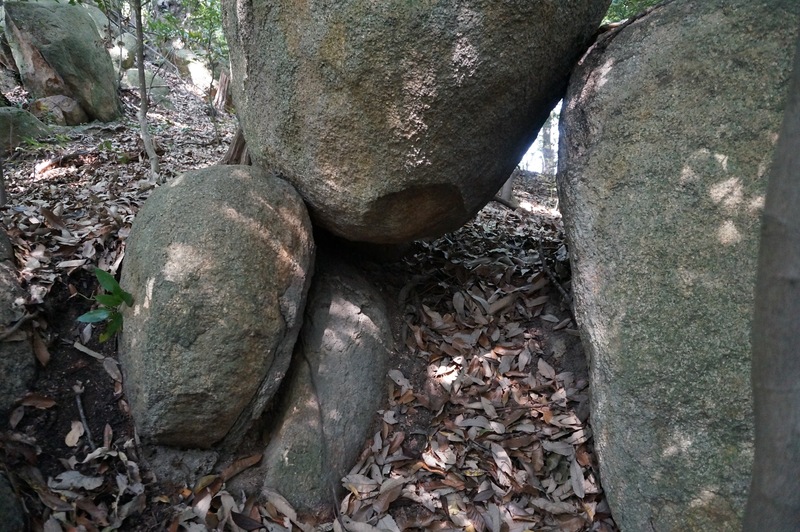 Other megaliths on the grounds include a grouping with a small passageway. The compass (red arrow points north) indicates that the alignment of the passageway is toward the west, probably sunset of the equinoxes. 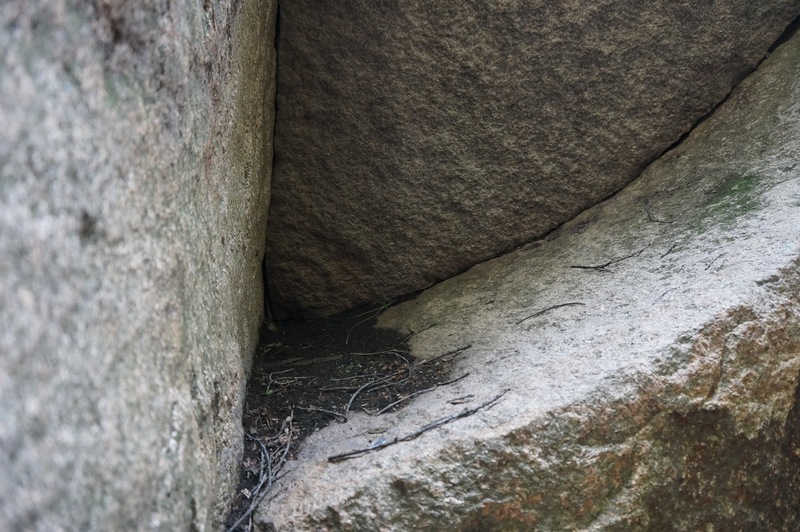 Another east-west alignment passageway, and other megaliths. 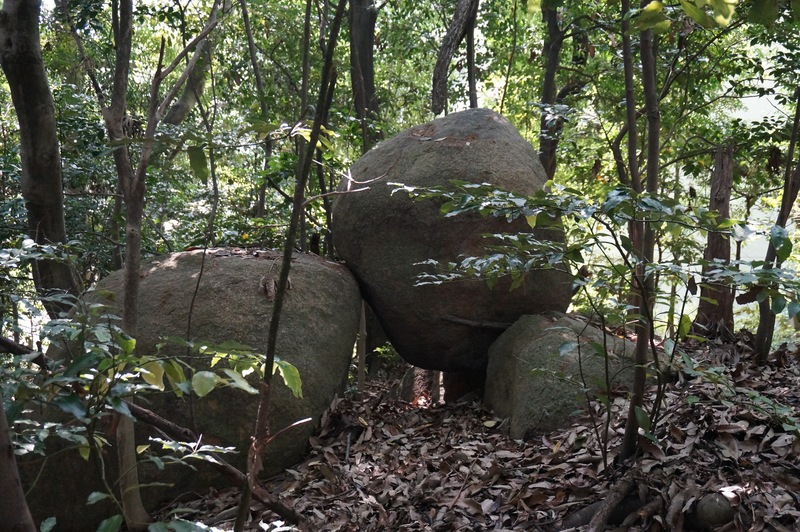 This entry was posted in Ancient civilization, Katakamuna, megaliths, Rokkosan and tagged Koshiki-iwa Jinja on 2014/08/25 by Okunomichi. 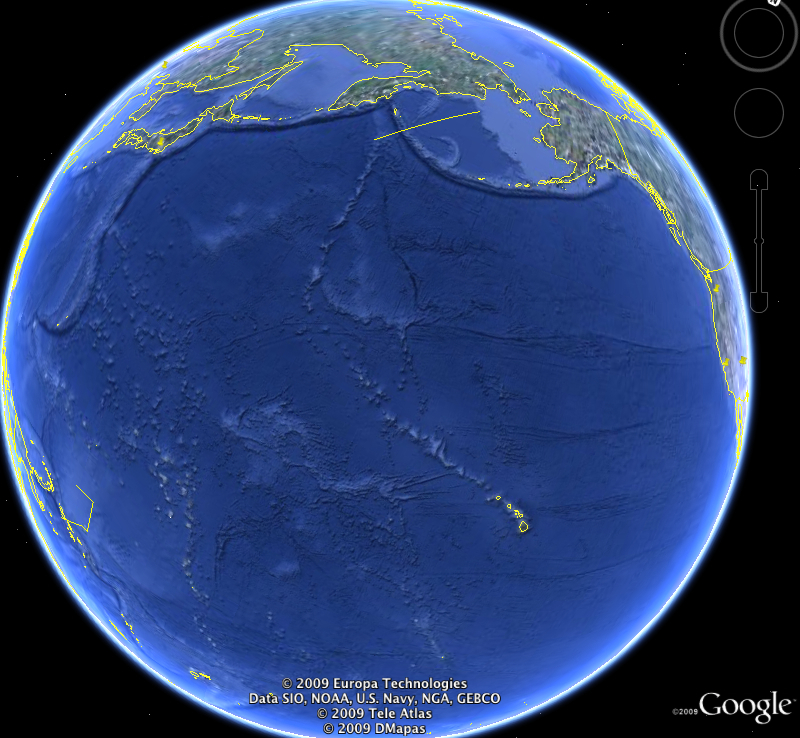 I am always amazed by the size of the Pacific Ocean. And I am impressed by Papahanaumokuakea. 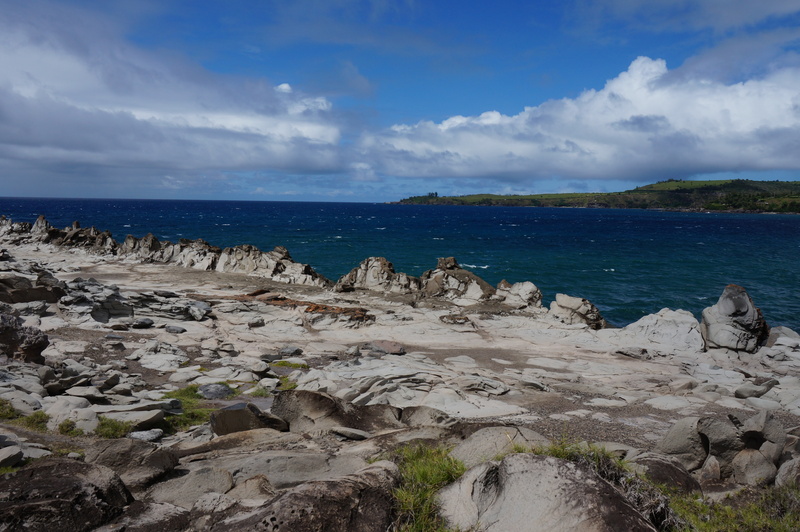 Papahanaumokuakea (Papa-hanau-moku-akea, Earth Mother-birth-islands-Sky Father) is the name of the Northwest Hawaiian Islands National Monument. 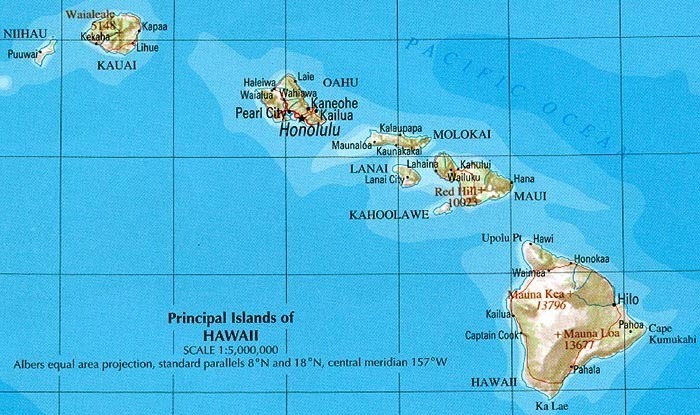 Extending the archipelago of Hawaii to the northwest, these islands make the state of Hawaii one of the longest in the nation. Hawaii extends from about 155 to180 degrees of west longitude, i.e., to the International Date Line, thus covering five hours of time zones. 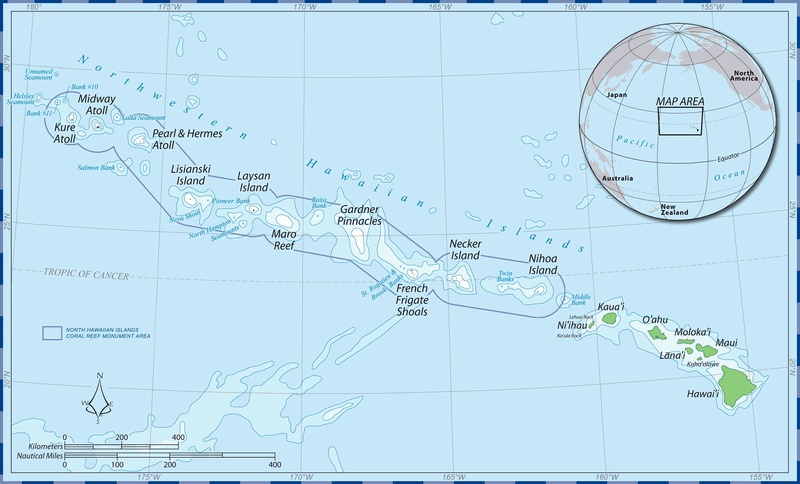 Please note the location of Necker Island which bears the magnificent Hawaiian name, Mokumanamana (Moku-mana-mana, island of strong mana energy). Mokumanamana lies right on the Tropic of Cancer, 23.5 degrees North latitude. 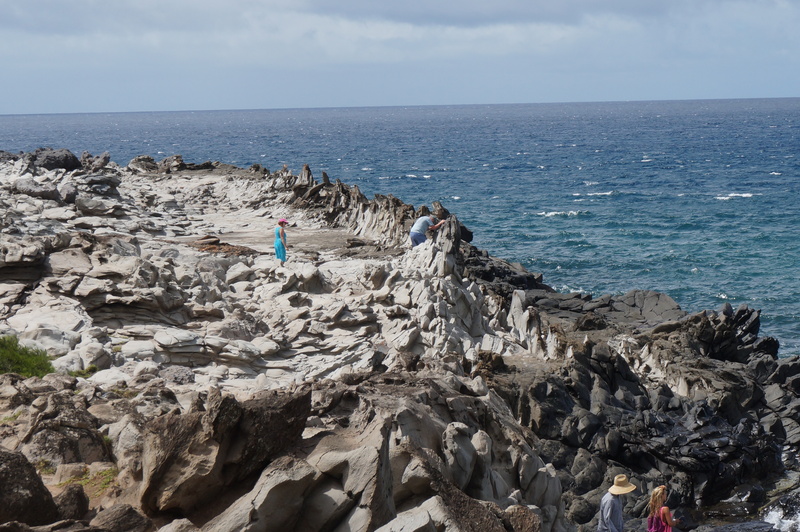 This island is so sacred that no Hawaiians ever lived there, yet they built 33 shrines on the rocky small island. Lying on the Tropic of Cancer means that this island has the sun at zenith on one day of the year, the summer solstice. The sun does not venture further north than this. For this reason, this latitude marked a solemn boundary between Po and ‘Ao, Darkness and Light, Other World and This World. 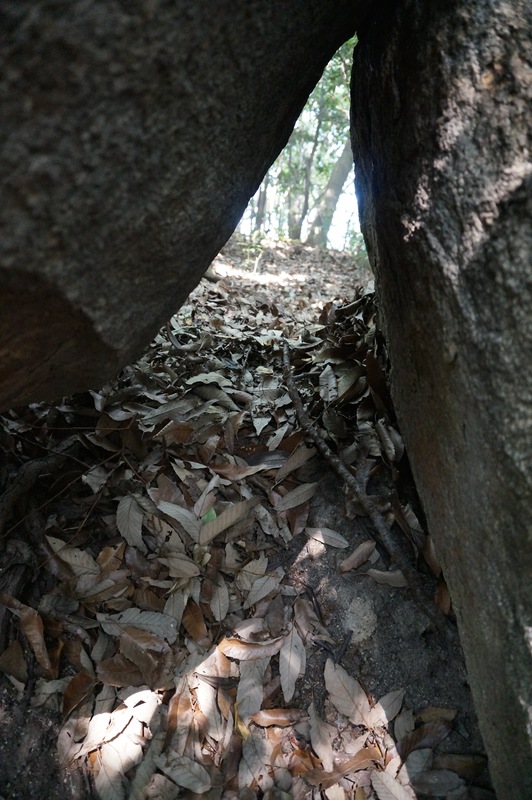 This entry was posted in Hawaiian Civilization, Nature and tagged Papahanaumokuakea on 2014/08/21 by Okunomichi. The name I’ao is very sacred. The first part, I, means cosmic spirit. The second part, ao, means primordial light. According to Leinani Melville (Children of the Rainbow, 1969, p. 20, 116), I’ao is the name for the Eternal Creator, the Primordial Lord of the Sun, the Primary Cosmic Force, the Supreme Being. It means Infinite World, Infinite Light, the Supreme Light of the World. 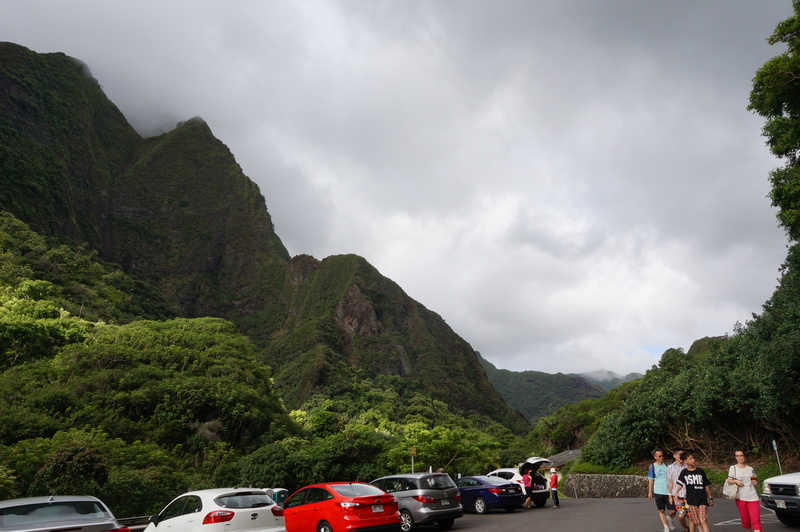 I’ao Valley was named after this supreme deity. 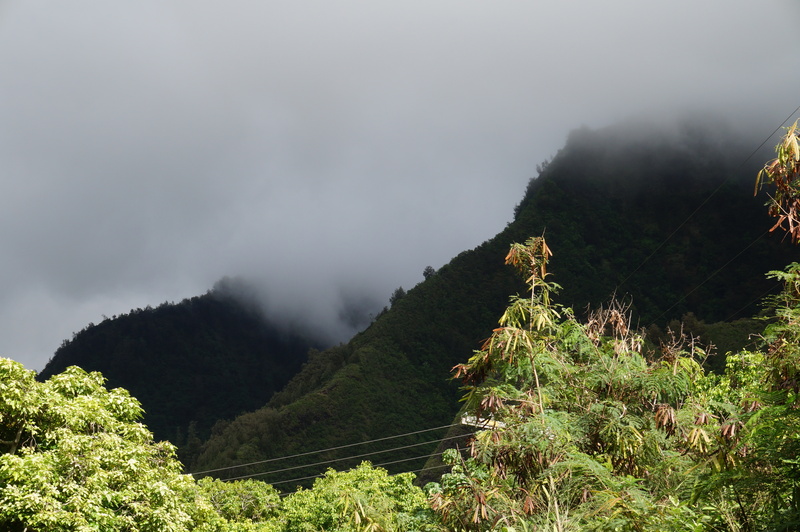 The people of Maui paid respects to the Creator at the peak in the valley which we call the I’ao Valley. 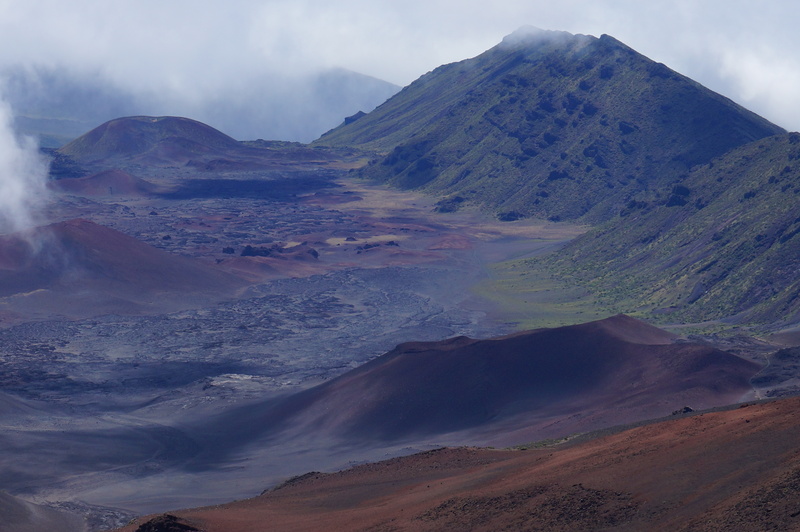 This valley lies in the watershed area of West Maui, Mauna Kahalawai. 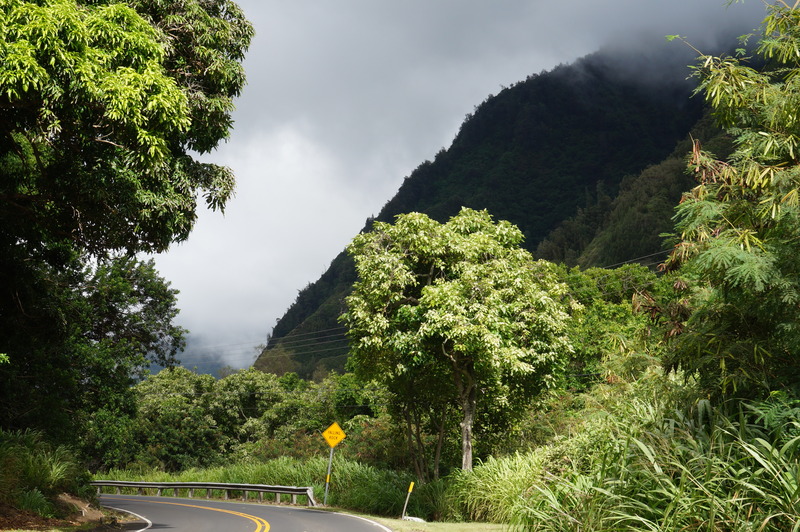 The morning we went to I’ao it was bright and sunny in Wailuku, and it grew progressively darker and more solemn as we drove deeper into the valley. It was sprinkling by the time we parked and started walking the paved trail through the park. Warned to stay on the trail, we cros sed over rapid streams as we wound our way up to the little pavilion. From there we had a clear view of the Needle, at least as clearas the weather permitted. We sat for a long while in the pavilion as visitors came and went. It was a powerful spot for meditation. We started downhill and walked slowly through the shower. The path took us along another stream, and as we sheltered under the trees we watched the eddies over and around the rocks. So fascinating that time stood still. 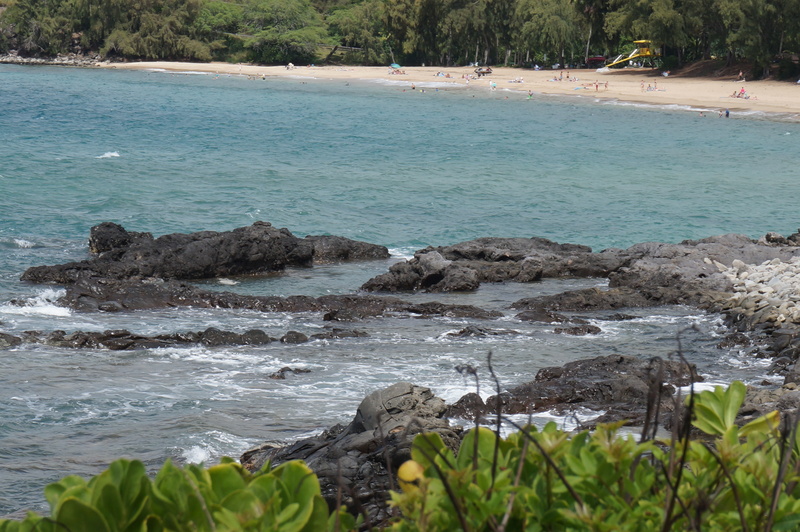 This entry was posted in Hawaiian Civilization, Nature and tagged Iao, Maui on 2014/08/21 by Okunomichi. 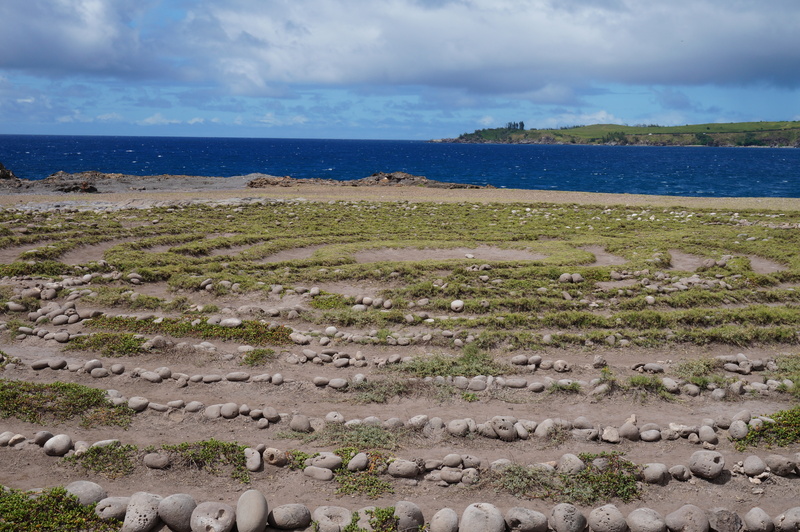 There is, at the northwest corner of Maui’s head, a labyrinth by the sea. 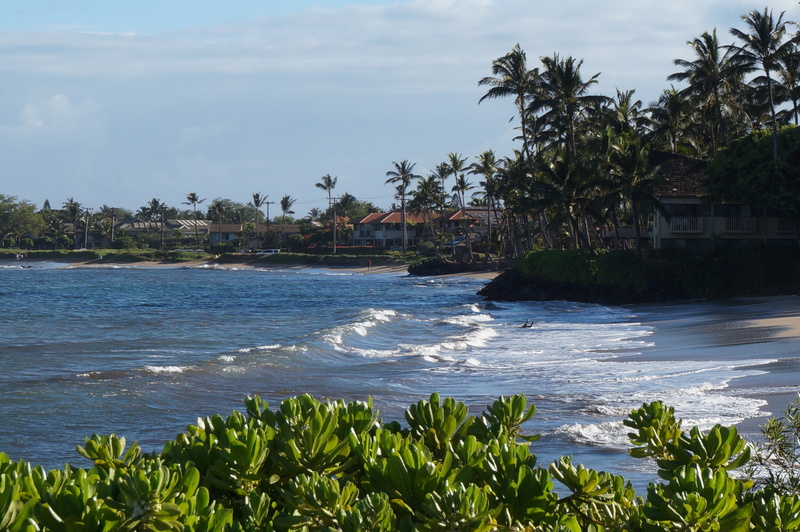 It is in the resort town of Kapalua, and indeed it can only be reached by walking at the edge of the golf course. 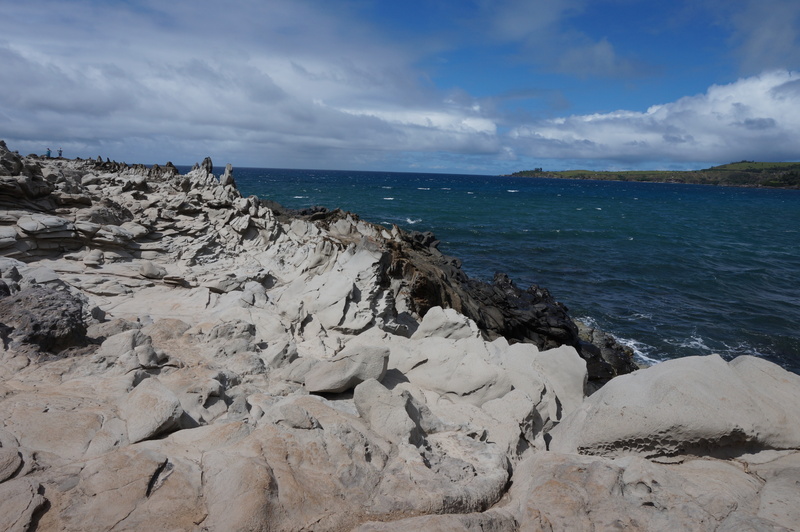 As we make our way to the point, we have the jagged rocks below and big crashing waves. This unique spot is not called Dragon’s Teeth for nothing. It feels like the primordial beginning of time. We veer to our left, remembering that the labyrinth was over that way. Just as we begin to doubt our recollection, it appears first a little then finally in its entirety. It is a full size labyrinth of Chartres design. It must have taken a group of highly motivated people who laid out the round white river rocks that form the pattern that is enhanced by green grass growing in between. We start our walking meditation. The path curves this way and that, sometimes taking us near the center then moving us away. The sun shines on, the clouds come and go, strong winds blow. It feels like there is only Here and Now, and at the same time this must be what Eternity is like. We go on and on. Winds blow harder and it begins to rain – and rain, and rain. We can hardly stand upright, much less walk. So we hasten back to the golf course and the parking lot. By the time we reach our car, the storm has passed. We can look out and see the neighbor islands. They seem so close. We are back from Eternity to Maui. 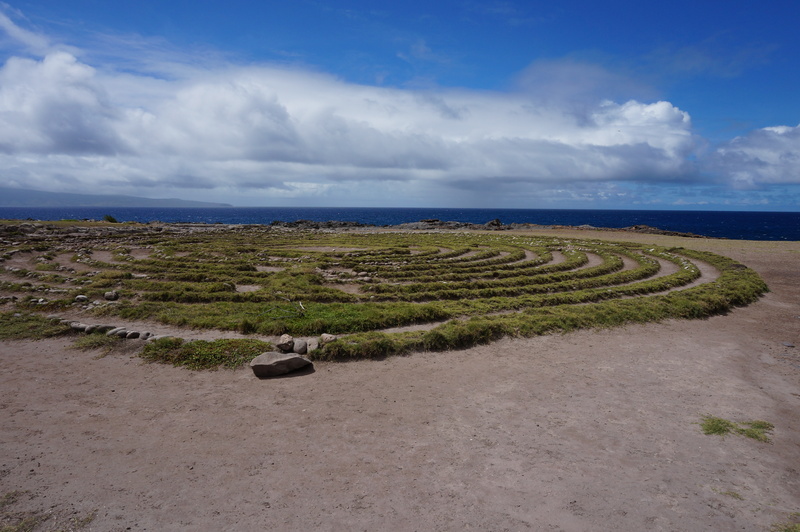 This entry was posted in Hawaiian Civilization, Labyrinths and tagged Maui on 2014/08/21 by Okunomichi. 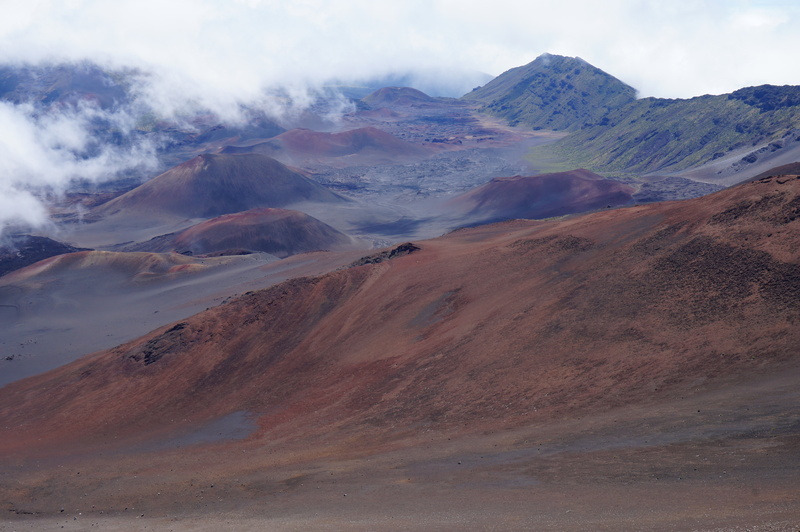 Haleakala is the sacred mountain of Maui. Rising to 10,000 feet above the clouds, it is aptly named the House of the Sun. 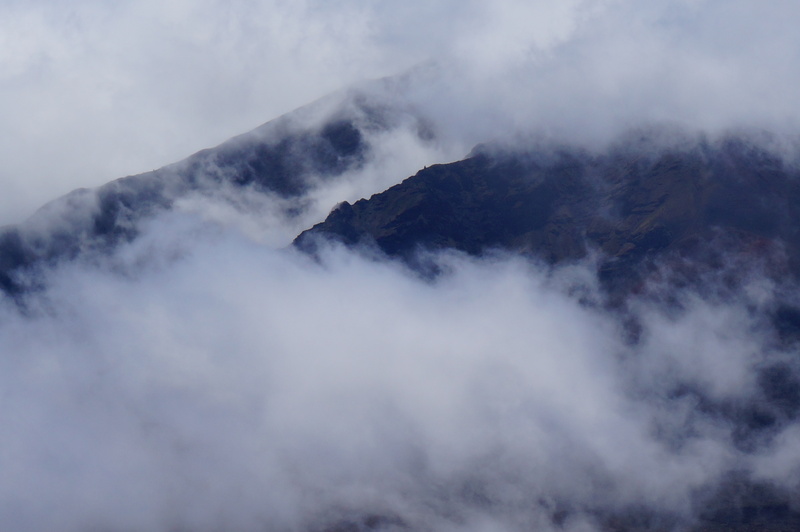 The people of Ha waii held mountains in high respect, and they did not live on mountains. See this sketch. Summits belonged to the mountain spirits. There was an altitude lower down from the summit which was suitable for shrines, but still not for people to dwell. People lived down on the plains, close to the sea. 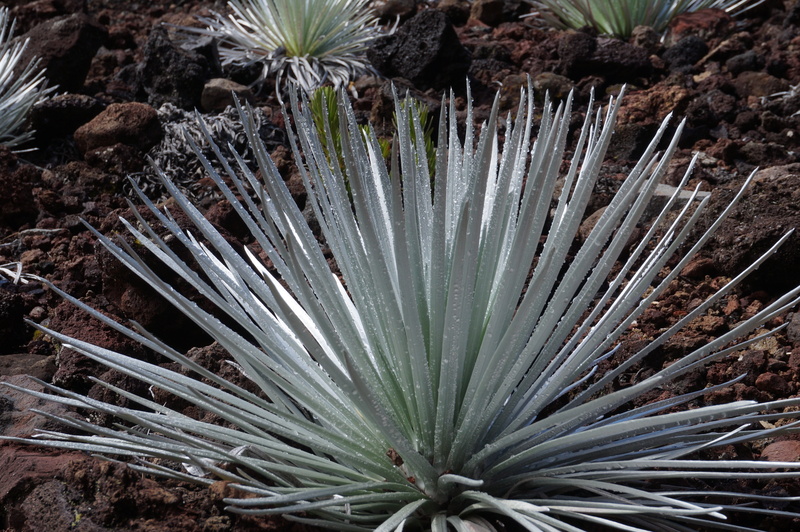 The ‘ahinahina silversword is unique to the summit of Haleakala. Although this name is translated as very gray, do I not see Hina the goddess of the moon? Wikipedia gives us the following information. 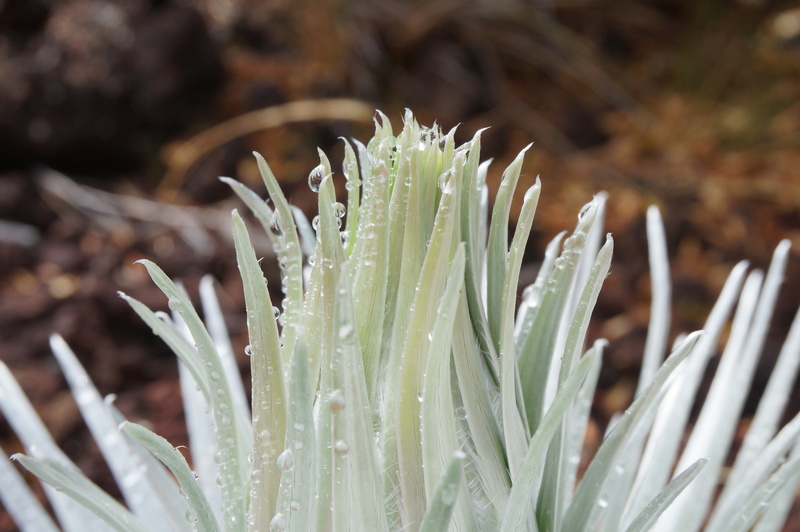 The Haleakalā silversword, Argyroxiphium sandwicense subsp. 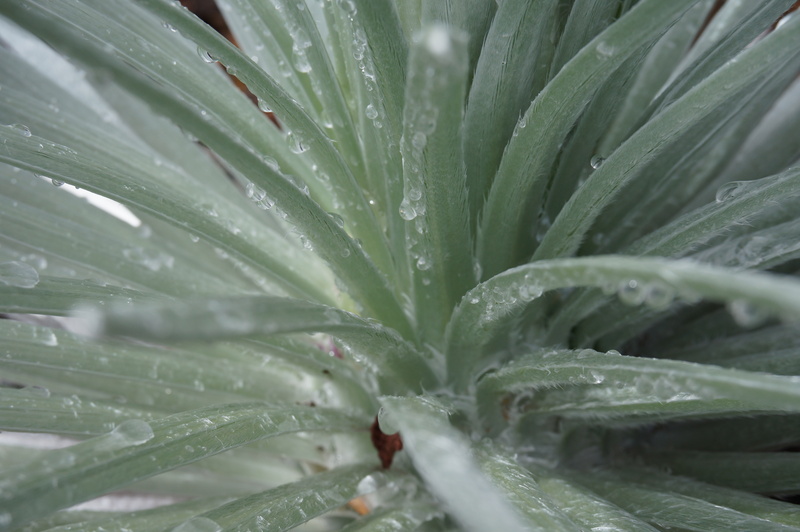 macrocephalum, has numerous sword-like succulent leaves covered with silver hairs. Silversword plants in general grow on volcanic cinder, a dry, rocky substrate that is subject to freezing temperatures and high winds. The skin and hairs are strong enough to resist the wind and freezing temperature of this altitude and protect the plant from dehydration and the sun. The plant’s base of leaves, arranged in a spherical formation at ground level o f the plant, dominates for the majority of the plant’s life—which may be greater than 50 years. The leaves are arranged so that they and the hairs of the leaves can raise the temperature of the shoot-tip leaves up to 20 °C (36 °F), thereby having adapted to the extreme high-altitude temperatures by focusing the sunlight to converge at this point and warm the plant. 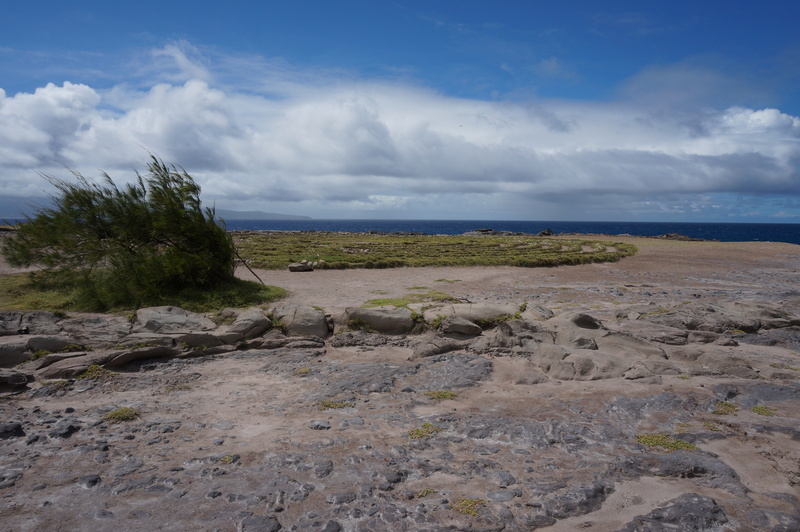 Here are some photos of ‘ahinahina that I took at the National Park Visitor’s Center. The sun had just emerged after a rain shower, and the ‘ahinahina were sparkling with raindrops. 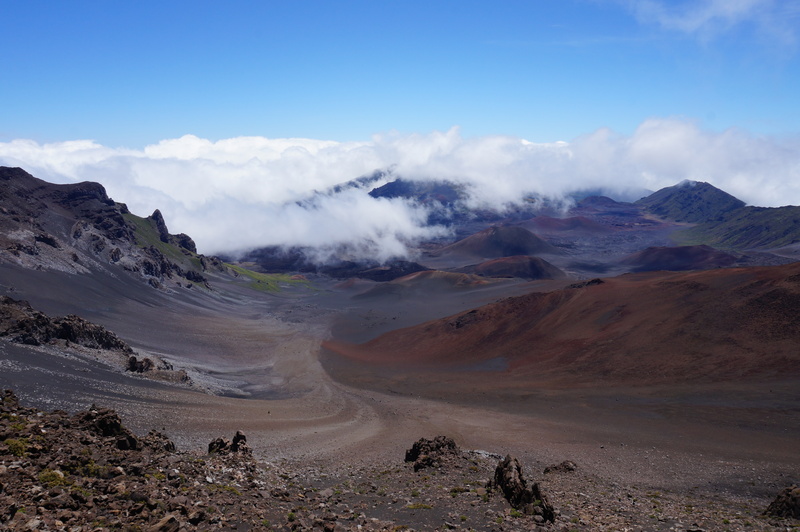 We drove through layers of clouds and rain and finally reached the Haleakala Visitor’s Center at the summit. 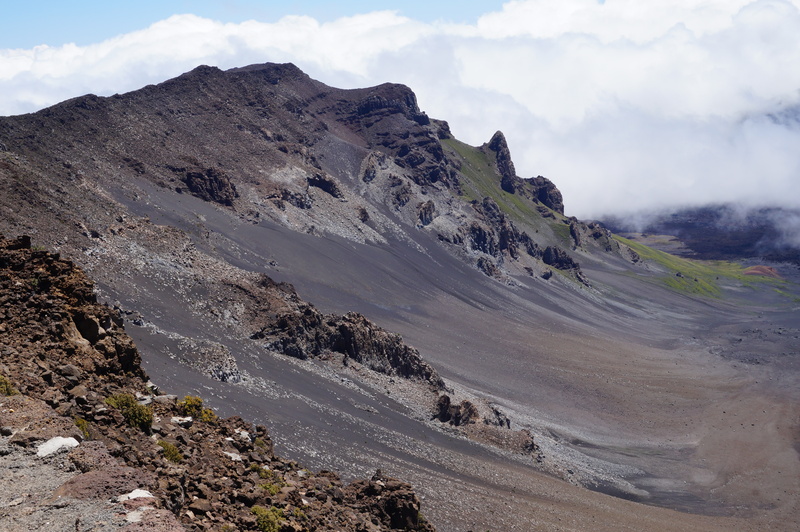 Here are some of the ever-changing views of the crater. 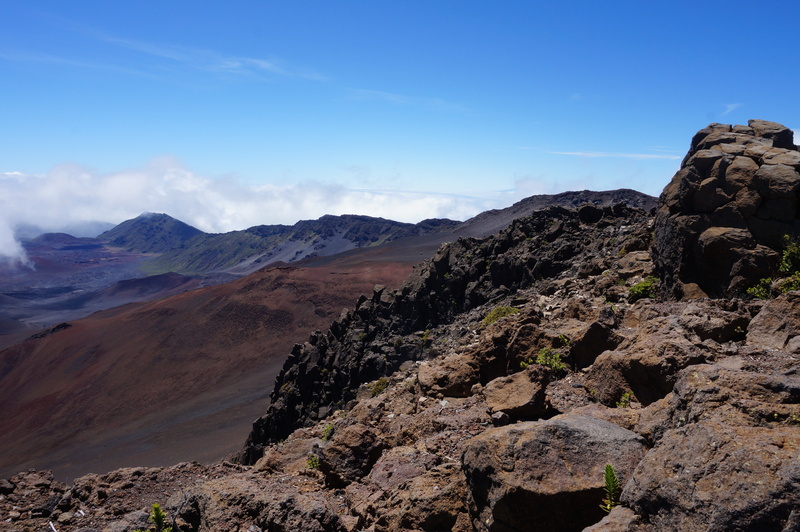 Truly, Haleakala is sacred, and so is the ‘ahinahina. Let us give them our malama, our protection. It is our kuleana, our responsibility. 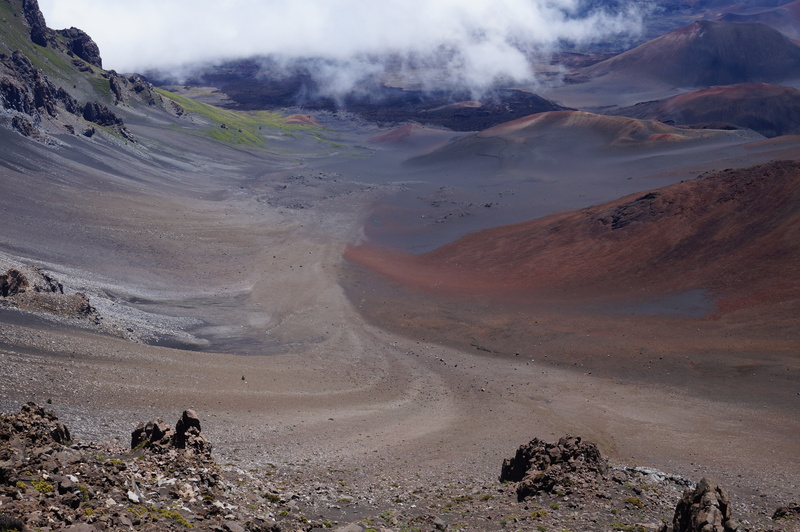 This entry was posted in Hawaiian Civilization, Nature and tagged Haleakala on 2014/08/21 by Okunomichi. 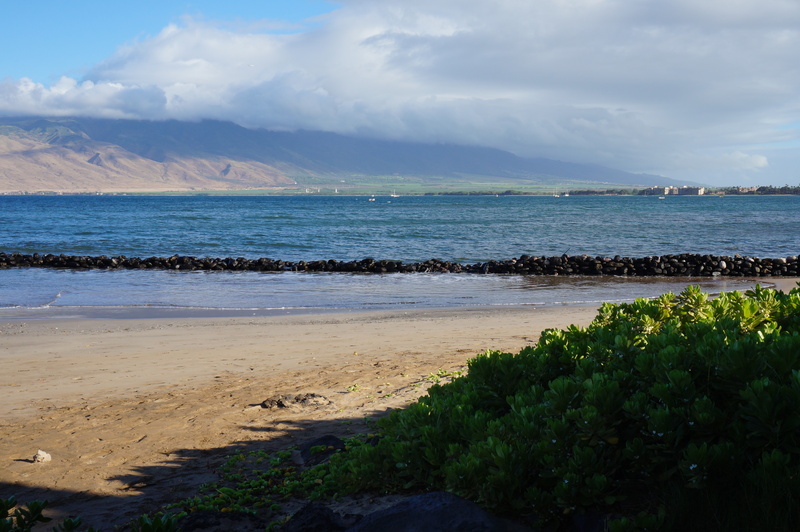 Recently, I had the opportunity to spend three days on the beautiful island of Maui. 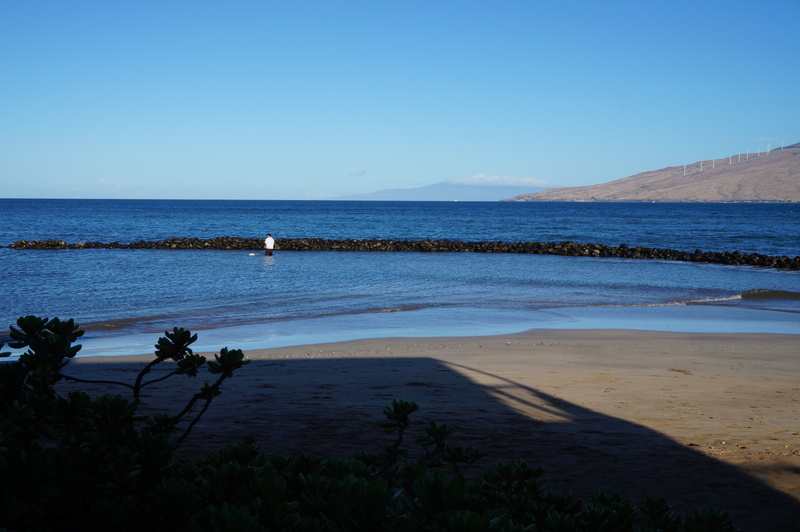 Early one morning, we parked out rental car at NOAA’s Humpback Whale Marine Sanctuary in north Kihei. 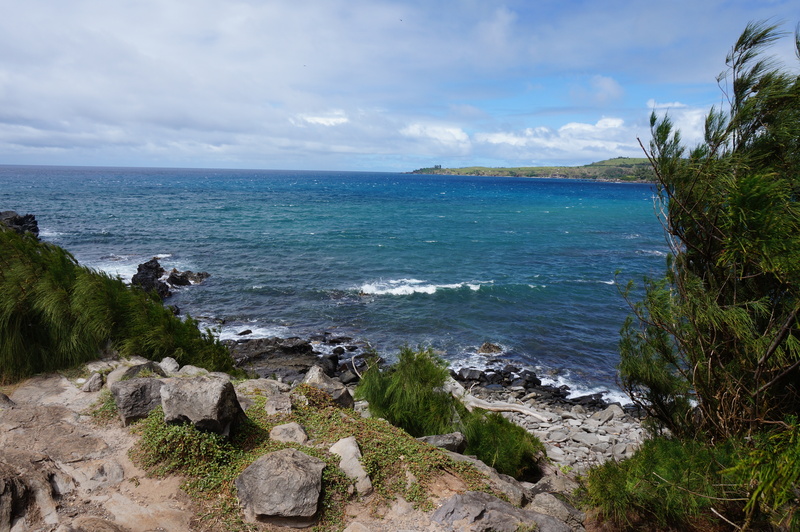 Here are some photos I took from the sanctuary looking toward the old Hawaiian Ko’ie’ie Fishpond. 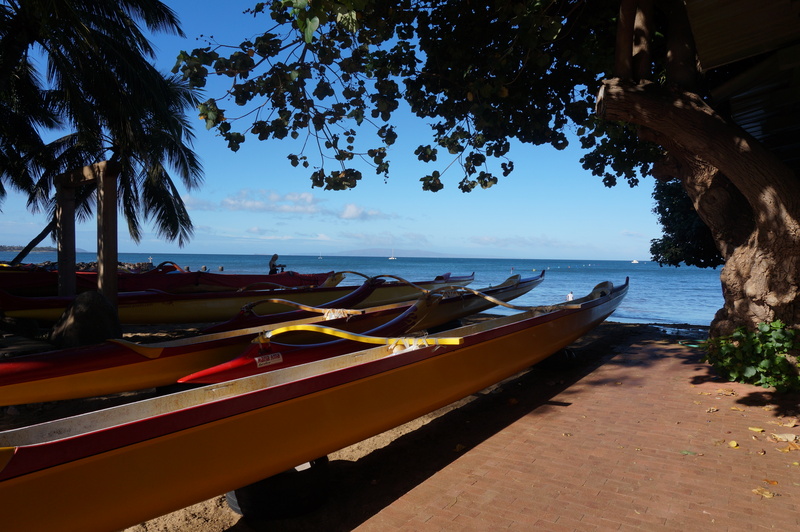 You can see twin-hulled canoes with twelve paddlers, like the canoes we used, only ours were painted red. 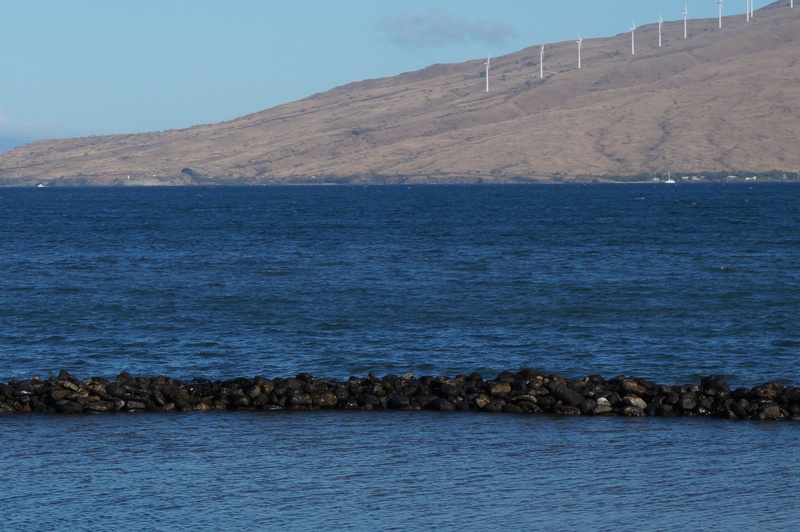 Fish farms were important as they supplied thousands of people the fish that were raised in natural sea water. The ring of stones encompasses an area of several acres, but this one has been neglected. 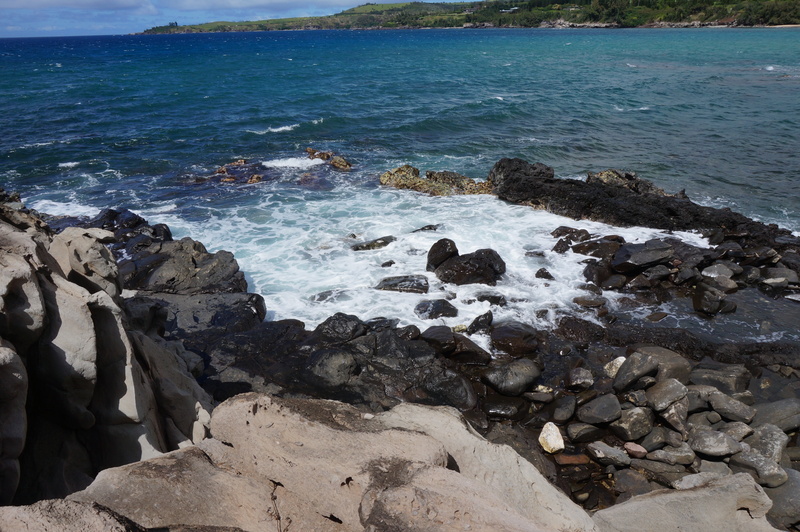 Kupuna Kimokea is leading the project to restore the three-foot wide wall. It is not merely an engineering project. It is cultural, it builds community, it is sacred. Rumors are that it was built by the little people of Mu, the Menehune, in one night. 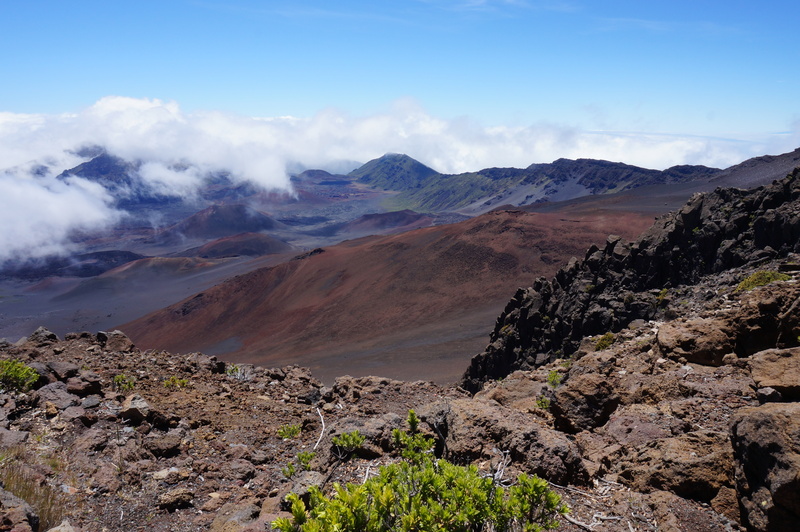 As Kimokea led us we chanted, repeating what he said, prayers to the spirits of the sea, land, and the mountain Haleakala. We asked for permission to ride our canoes in the waters and for their blessings. It is amazing that even though we did not know the Hawaiian words, the words still came out of our mouths. 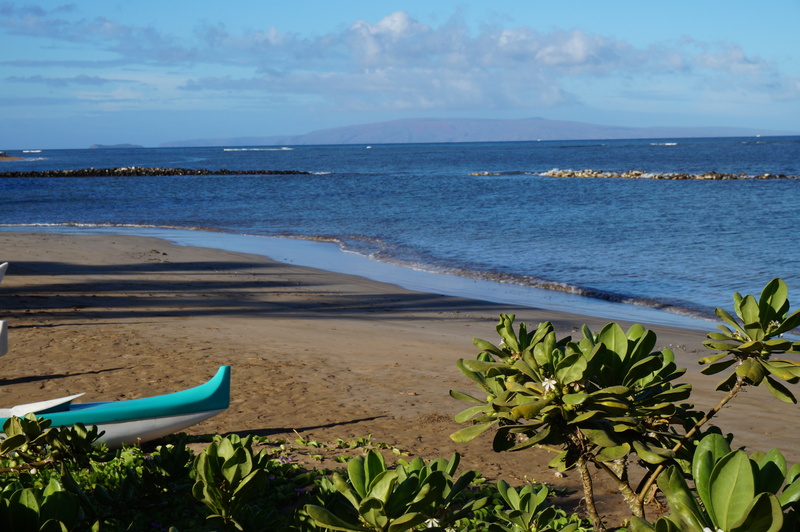 Then, we pushed off, climbing into the canoes which were rapidly moving out to sea. We took up our paddles and followed the beat of the lead paddlers. We changed from outside paddling to inside paddling when commanded. The ride was swift and smooth. It was surprisingly easy to paddle with twelve of us doing it. With sun on our backs, the wind in our hair, it was a deep pleasure to skim over the green water. 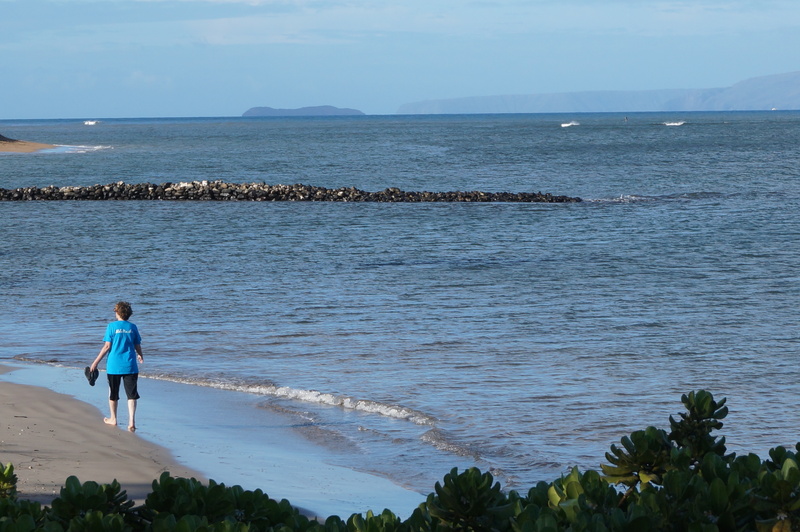 All too soon, the fishpond came into view and we pulled up onto the adjacent beach. Somehow it was harder climing out of the canoe than going in. Next, after another chant followed by instructions, we set about restoring the stone wall. 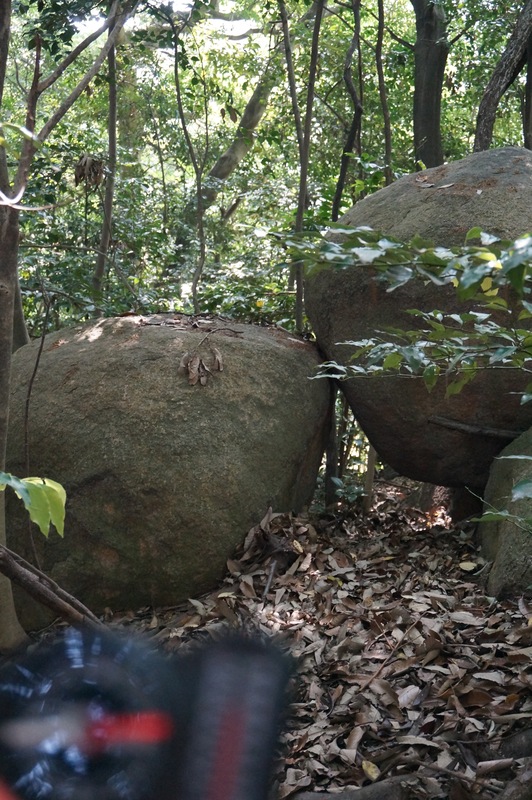 There are father stones and there are mother stones. They are set alternately in the wall. Our job was to insert children stones, ‘ili, in between. The ‘ili hold the stones together. 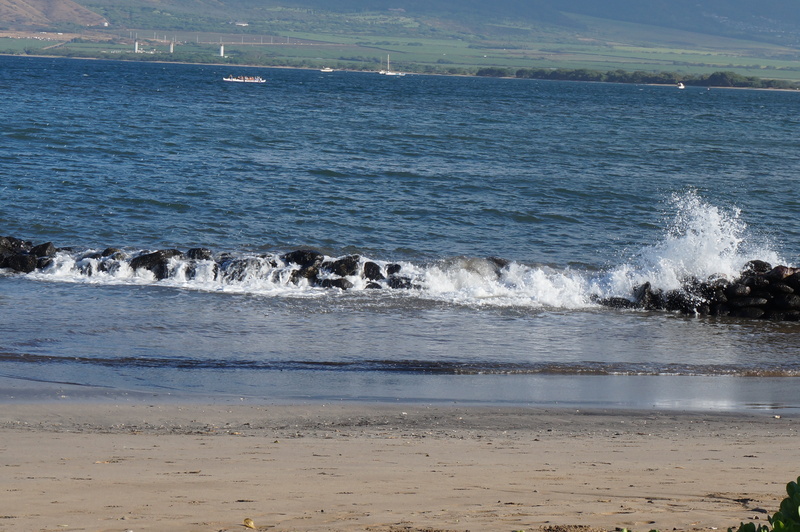 This we did as we reached into the sand and pulled up handfulls of ‘ili while the surf crashed over us. We did not complete the wall that day. Nor will it be completed for quite some time. It will take the combined efforts of many, many pairs of hands. But slowly and surely it will be done. What have I learned? That a community prospers when its members join together, whether to paddle a canoe or to build a fishpond. I would like to return to the time when people were more closely connected together, where they were held together in the loving arms of relationships. 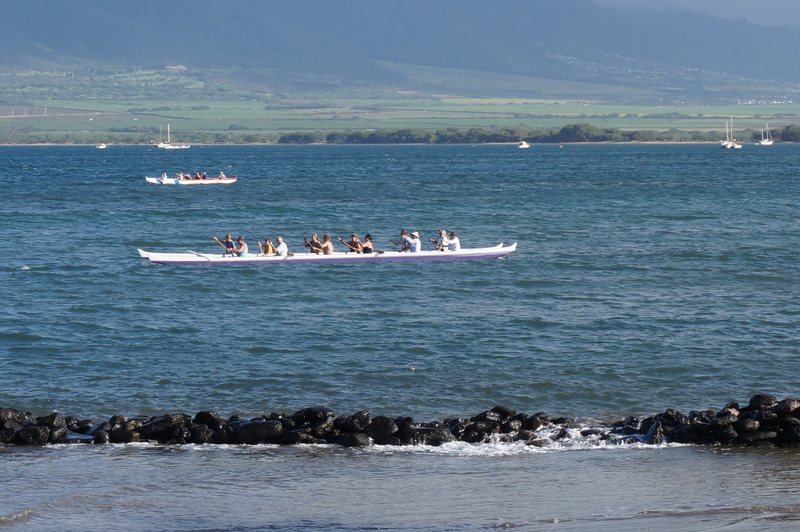 This entry was posted in Hawaiian Civilization and tagged Canoe, Fishpond on 2014/08/21 by Okunomichi.